After the first three weeks, he noticed several young couples with children attending the worship service but not attending Sunday School. That very day a man and his wife approached him asking if they could lead a Sunday School class for these couples. “Right now, I would say I probably have 10 leaders that have come in to help plant the church,” Hay said. Hay, who has worked as bi-vocational pastor for about nine years, most recently served as pastor of LaCrosse Baptist Church, located north of Gainesville. He and his family were happy there but last fall he began to feel God’s call in a new direction. The former Sampson City Baptist Church had dissolved several years ago, and the vacant church had become an eyesore. But last year the New River Baptist Association started working to renovate the church and clean up the grounds, enlisting volunteers from the surrounding area. Hay officially became pastor of Cornerstone in February. Trinity Baptist Church, in nearby Keystone Heights, is the send church for this replant, sending members to help start this new church. With the help of Trinity members, the church also held a Neighborhood Block Party on March 16 with bounce houses, games, hamburgers and hot dogs, to help attract newcomers. 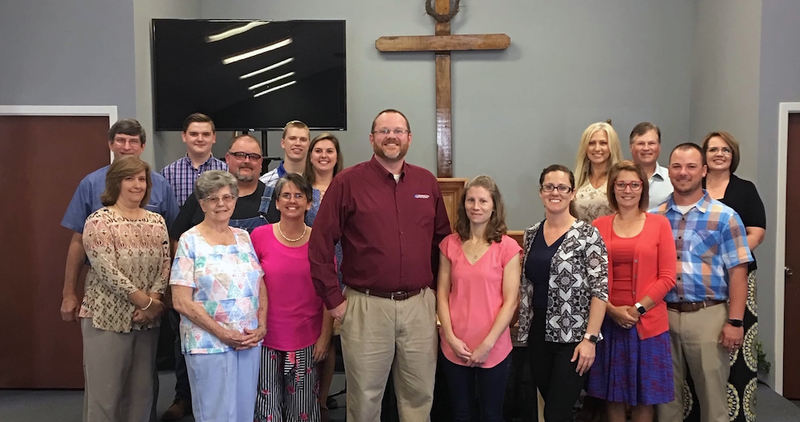 In true Baptist fashion, the church held its first potluck in early April, with some 60 people who had signed up in advance to bring a side dish. To start the church with just five people – Hay, his wife and three children – and go to 60 for its first potluck is amazing, he says. It’s a testament to what God is doing there at Cornerstone Baptist Church.